The upcoming week will be eventful for students and scholars with an interest in issues of film preservation and presentation in Amsterdam. Thursday 17 April Sonia Campanini, joint PhD Candidate of the Università degli studi di Udine and the University of Amsterdam, will be defending her dissertation on the preservation and presentation of film sound with particular attention to sound practices of the silent era. Info on the defence can be found here. Sonia gave a very fascinating guest lecture on her research on among other things Gaumont’s Chronophone in a seminar series on research methodology which I co-taught in early 2012 for the students of the Preservation and Preservation of the Moving Image MA, so I am particularly excited about seeing the final outcome of her research very soon. The dissertation committee will include among others Barbara Flueckiger, Professor of Film Studies at the University of Zürich in Switzerland. At the Media Studies department of the University of Amsterdam we saw this as a nice occasion to invite Flueckiger to give a guest lecture on her extensive research on the historiography of film color, her Timeline of Historical Film Colors and the broader activities of her Diastor research team. As I have had the responsibility of setting up that lecture and can see that there are still a few places available, I post the info on it below for people who might be interested in joining. 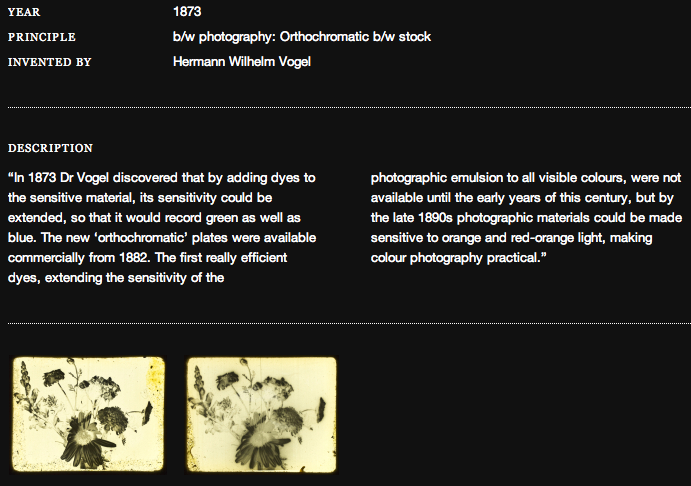 Description of Hermann Wilhelm Vogel’s color system in the Timeline of Historical Film Colors developed by Professor Barbara Flueckiger at the University of Zürich. Tuesday 15 April between 5.15pm – 7pm, the Media Studies department of the University of Amsterdam will be welcoming Barbara Flueckiger, Professor at the University of Zürich, for a guest lecture on digital film restoration and film color historiography. The lecture will focus on Professor Flueckiger’s current research in the framework of the project DIASTOR Bridging the Gap Between Analog Film History and Digital Technology (http://diastor.ch/), and its recent involvement in the restoration of Robert Wiene’s “DAS CABINET DES DR. CALIGARI” (1920). After the lecture there will be a Q&A and an open discussion. This entry was posted in Digital Film Historiography, Film Color, Film Heritage, Film History by Christian Gosvig Olesen. Bookmark the permalink.